Apple is offering to repair at a reduced price iPhone 6 Plus smartphones with display flickering or multitouch issues. The problem, described in August as “touch disease” by repair guide website iFixit, is characterized by a gray, flickering bar at the top of the display and an unresponsive touchscreen. The issue affects both the iPhone 6 and the iPhone 6 Plus, according to iFixit. The company is now offering to repair the problem for a service price of US$149 if the phone is in working order, and the screen is not cracked or broken. The problem, however, runs deeper, according to iFixit. Merely replacing the touchscreen doesn’t fix the issue as the gray bar eventually shows up on the new screen, too, it said. It quotes repair experts as stating that the problem is with the two touchscreen controller chips, or Touch IC chips, on the logic board inside the phone, which convert touch information into inputs for the phone. On Thursday, iFixit said it had found that stress on the phone causes the chips to eventually lose connection with the motherboard, and pointed to "insufficient structural support around the logic board." It said it had seen the problem on phones that have never been dropped. 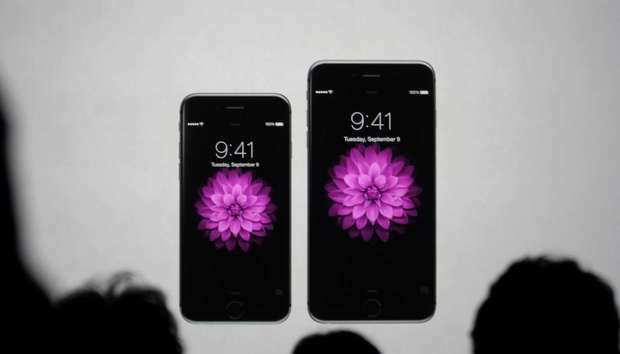 A proposed class-action lawsuit on behalf of iPhone 6 and iPhone 6 Plus users was filed in August by a law firm, alleging a design defect in the iPhone 6 series phones. Apple has offered to reimburse the cost difference to those iPhone 6 customers who have already repaired the phone earlier for the same issue either through Apple or through an authorized service provider. Those who have paid for a repair believed to be related to the issue but have not been contacted yet by Apple, are asked to get in touch with the company.